Now that I have your attention, there is a serious issue with foiling that needs to be addressed. As foiling gains in popularity I can see a situation where the learning curve for getting into kitesurfing is going to be so high that the average Jill or joe is going to be so intimidated by the skills and cost required to be considered good at it or even get started that they just won't bother. If seasoned kiters with years of experience under their belt find it really challenging then what chance the lay person. Unless you grow up in a kiting family even young people won't take it up. Basically the sport will die, windsurfing style, as the old time afficionados age with it. On another note why is mowing the lawn suddenly cool now just because it's 1m up in the air and you spent $2k to do it? Anyway just some random thoughts while I get frustrated by my time off the water. I haven't said anything too controversial have I? On another note why is snowboarding popular? 99% of people can't even edge properly... Or twin tips. Most people can hardly get the fins clear of the water. It's not "really challenging", just a steep initial learning curve. Unless you're an egg. Nothing wrong with eggs............Egg Boy would give it a fair crack!!!! I would think most people looking to get into kiting would see foiling as a separate discipline that they may explore once they've learnt to fly a kite and control a board. I don't see how foiling will in anyway deter people from taking up kitesurfing. It's just a different way and another choice to kite. I might want to try foiling soon but if I find it too hard for me to learn I won't then give up kiting all together. And what is wrong with getting on the water and just mowing the lawn, if that's what you are into? Each to there own. I'd try foiling myself if I was you and then Decide if it will be the death of kiteboarding and also if it is mowing the lawn in air. You'll find you are incorrect on both accounts. I think foiling will recruit more people to kiting. Imagine youre a 14 year old sailing a fast little boat, and a kitefoiler overtakes you on an upwind tack doing mach 3. You would never want to sit in your boring little bathtub again. If it thins the crowds, is that bad? But windsurfing died when it got too expensive. Kiting hasn't done that yet. But innovations like the click bar will lift the average cost and see prices rise further. A decline in the number of new kiters is potentially a win for existing kiters if there is a surplus of gear being produced, meaning lower end of season prices for all the regular joe current kiters out there. If you hunt around there is enough gear available now that would cost you the same as a single kite for a foil setup. And yet it creates the need for less wing size in your quiver. Can't remember the last time I was anything bigger than a 10m. 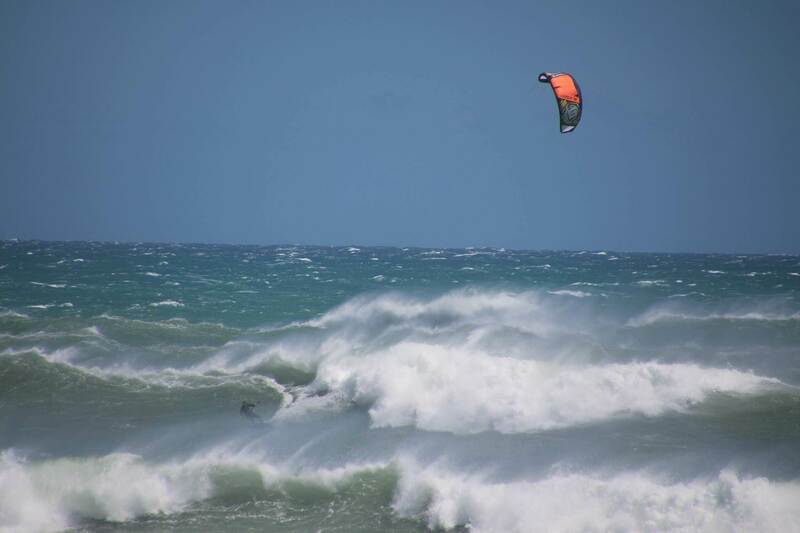 Also it has given us numerous sessions already that we wouldn't have even bothered given the lack of swell and wind. It adds another dimensions that needs to be experienced to understand. It is anything but mowing the lawn... although it can look like that from a na?ve perspective. You are right there, I think that's why heaps of sailboarders are now jumping onto the foil craze, its been a savior to the dwindling sailboarding industry. I see a few sailboarders on foils. None have progressed past the very beginner stage yet. They're still not riding in proper light winds. 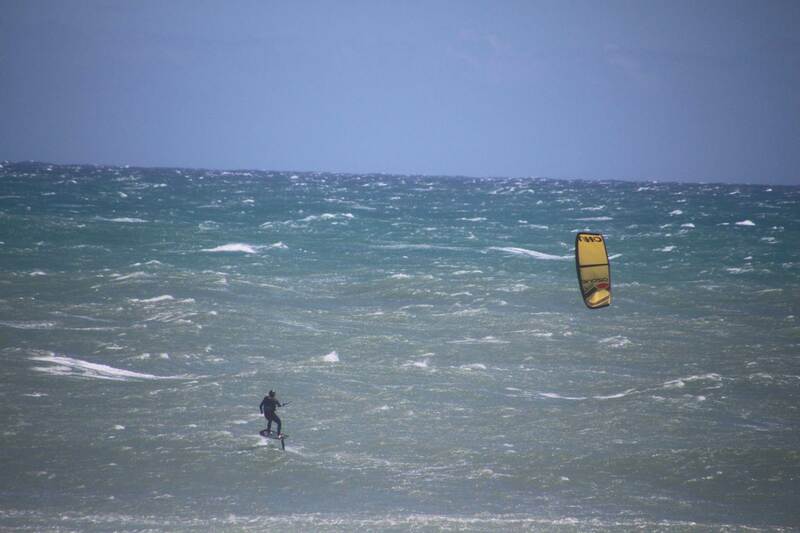 They tend to do what windsurfers always do. Ride out. Crash. Ride back. Crash. Repeat. I'm not sure I care whether people take up foiling. It's their loss if they don't. We get the beach to ourselves on so many perfect days. It's a little bit annoying to have to share on stronger days. Certainly at the competent intermediate level I can do everything on a foil that other people do on surfboards and TT. The only thing I can't do that I used to do on a TT is kiteloop air gybes. I miss them, but I gain everything else you can do on a foil so it's a fair trade. 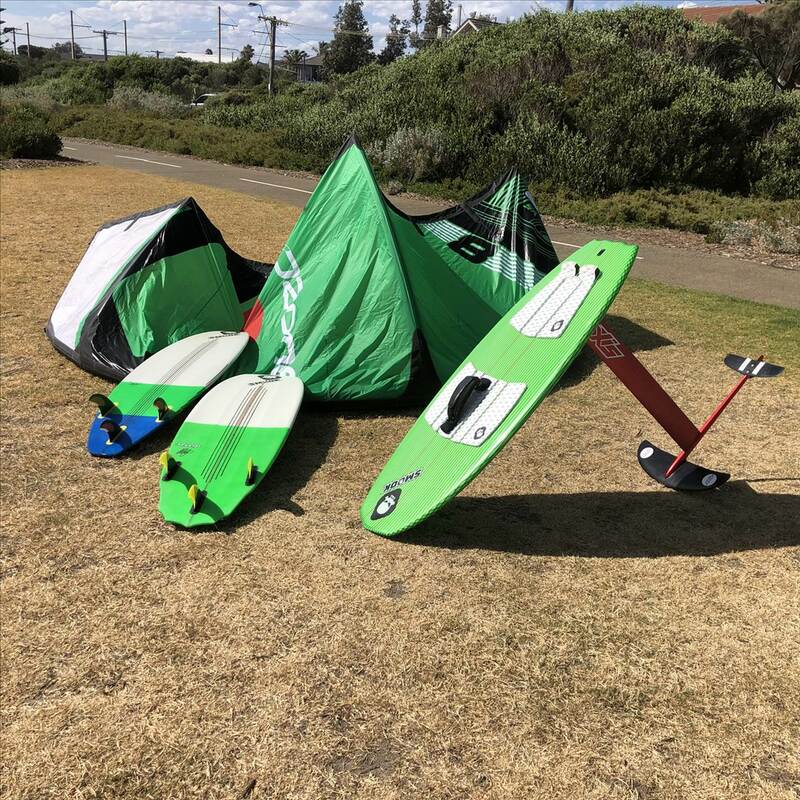 A decent surf-sized foil and a 7-8m surf kite will easily encompass the range of a TT or surfboard and a 2-3 kite quiver. Add a 12m and a 4m and you're good for 10-40 knots comfortably. Foiling is only difficult for experienced kiters because they have the perception that it will just be a small adjustment from their normal kite sport. It is actually very easy to learn with the right tools and advice/coaching. Experienced kiters learn very quickly that few of their board skills transfer across. I speculate that it would be easier for a beginner to learn foiling than the most experienced kiter (towed behind a boat) because they have no preconceived ideas or muscle memory to change. I think every kiter that want more water time will all add a foil to their quiver. It will extend the season by at least 3 months without changing your current kite quiver. The fact that you can be fully powered in just 12 knots of wind with a 10m kite makes you think. It makes no sense not to foil with a kite IMHO. imo foiling is cheaper as you can basically get away with one kite quiver for 95% of wind strength. If you can fly a kite in light wind you can use that one kite from sub 10 knots to over 20 . To all foilers, please post a pic with your JUMPS, which is a basic TT skill. No pics? Ah well...Before you *jump* into conclusions, I do foil. Some people are unable to jump on TT or SB, and that's ok. Show us something else than. Oh, and high wind foiling? Or RedBull King of Air? It won't happen. High wind foiling 35-40 knots, 4m uno. The above photo looks pretty benign. 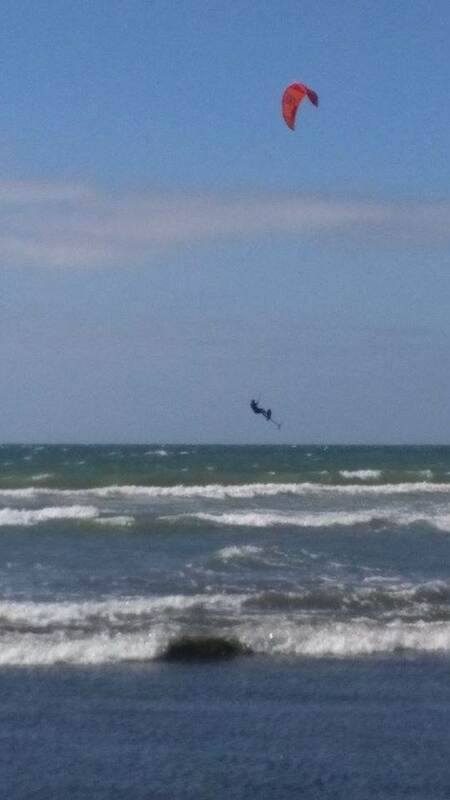 But below photo (not me in the pic) is the 100m upwind of the above photo pic. It certainly was not a benign day! I haven't got any pics of me foiling waves yet. But I can and do get into head high plus waves on the foil. Now you are in 0.1% which proves what exactly? Plummet wins. As always ;) How is that helping with the sales, I do not know. Maybe with selling telescopes with 60x zoom. PS I gave you greenie, just for the effort of jumping the foil. Please don't tell us that YOU have built this foil. We know. Thats pretty epic ,4m and overhead waves does add a level of excitement! On mutant. Not on foil. I am a little confused on what you are asking for and why ? If I want to jump get on my TT with a 10m rebel in 25 to 30 knots. high wind foiling wont happen ? Yeah nah, Foiling is a global phenomenon not limited to just kiting. You can get a foil for anystyle of board now. SB, SUP, Kite, efoil, various yatchs including america's cup.... hell even windsurfing is getting foils and that sport was cancelled 15 years ago! Foiling looks like mowing the lawn because the action is occuring under the water. From the land you cant see the sensations that are occuring. needless to say foiling is not a spectators sport, it is a participators sport, You need to feel the action to understand it. It does happen on every blue Moon. Shouldn't this be in the victa section ?? The foil in big waves and winds looks like a rush. You asked for pictures of high wind and jumping so i provided it. What does it prove? I thought Plumm wrote this. Why? Because we need a TT and SB riders to please the crowd. The same crowd who buys gear b/c they got exited watching you doing your stuff on a TT which you are NOT doing on a HF. AFL does not need a crowd for survival?